Large encampments of homeless people living under ragged tents and tarps, surrounded by cardboard boxes, shopping carts overflowing with treasures that to others resemble trash, fill the streets overlooking the Hollywood 101 Freeway, in the shadow of Los Angeles City Hall. It’s not a situation unique to the area, these encampments exist in cities and neighborhoods all across Los Angeles County. And it’s a problem growing faster than city and county have been able to handle. On Tuesday, a Los Angeles councilman proposed that the city house about five dozen homeless people in trailers on a downtown parking lot next to a state historical monument and major cultural tourist center. 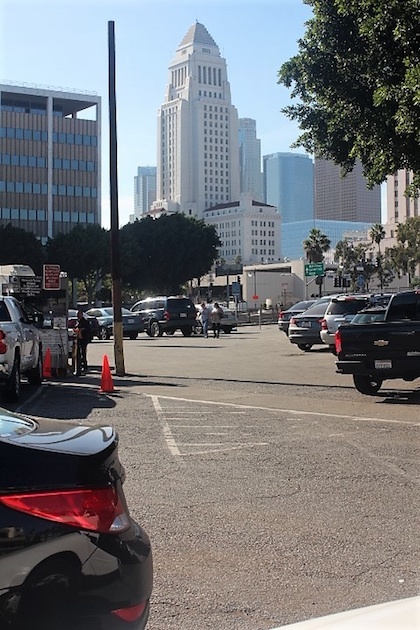 The proposal, outlined in a motion introduced by Councilman Jose Huizar, calls for installing five trailers on a city-owned parking lot at Arcadia and Alameda streets next to the 101 Hollywood Freeway. The plan is to house people who sleep on the sidewalks in the area around the historic El Pueblo de Los Angeles Historical Monument, home to Olvera Street, the America Tropical Interpretive Center, the Chinese, Italian and Social Justice Museums, and some of the city’s oldest structures, all located steps from one of the city’s busiest transportation hubs, Union Station. In addition to being an important historical landmark, El Pueblo is a major tourist attraction, drawing upwards of two million visitors a year. Huizar’s motion says the shelters could be installed and operated for six months at a cost of $2 million. The councilman said the annual cost after that would be about $1.4 million to operate the site, and that more temporary shelters of a similar nature are in the works for other areas of the city. “This is the first of its kind. We’re not necessarily calling it a pilot, because we’re hoping to work on others at the same time,” Huizar told City News Service. through $1.2 billion in voter-approved bonds under Measure H, which was passed in 2016. Garcetti has said he hopes temporary housing can be placed on other city properties throughout Los Angeles to help serve the estimated 25,000 unsheltered homeless people in the city. El Pueblo’s General Manager, Chris Espinosa, is a member of the mayor’s task force. He told EGP Tuesday that homelessness is an ongoing problem at the historical monument, which also happens to be the city’s birthplace. 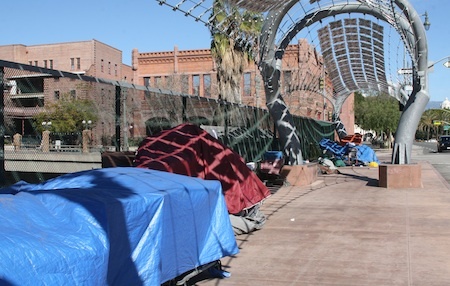 El Pueblo’s staff and commission are sympathetic to the problem of homelessness and are very interested in working with the city on initiatives to improve their plight, Espinosa said, adding, however, that the large number of homeless encampments on Main Street, Arcadia, and Spring Street have raised security concerns at the state monument. The parking lot where the trailers would be located is run by El Pueblo. Revenue generated from parking fees help cover the monument’s operating expenses, which have been on the rise as security and other costs related to the homeless population grows. The monument includes Father Serra Park, a grassy area located off Los Angeles Street, between the monument’s main plaza and museums and Union Station. Every day, large numbers of homeless men and women, “some with mental illness and drug issues … some who are just poor,” use the park as a place to camp out, Espinosa told EGP. “We really freaked out when we started hearing about the spread of hepatitis in the homeless population,” Espinosa said. “We started doing twice weekly cleanings, sanitizing the area,” he said, adding that although the practice helps stop the spread of the disease it does nothing to move the homeless into housing. On the security front, merchants and visitors have complained about the aggressive behavior of some of the homeless. At El Pueblo Commission meetings, merchants complain that their employees and customers report being harassed and worse. They report drug activity in the public bathrooms, and the difficulty of keeping those areas clean for visitors. “About a year ago, I had to hire an additional security guard for each shift, three shifts, and we had to put up specialty fencing and buy more security cameras” to help deal with the problem, Espinosa said of the added cost to the operating budget. “Six months ago, LAPD added a dedicated foot patrol here, and that has been excellent addition,” he said. According to Espinosa, the El Pueblo Commission has not yet voted to support or oppose Huizar’s motion, but he noted that some of the commissioners have been involved in discussions of the plan. Huizar’s motion opens the public discussion about how the program will work, not just at El Pueblo, but other locations throughout the city, he said. The mayor was personally involved, engaged, and the goal is to look at city-owned sites with high concentrations of homeless, Espinosa said, noting that inclusion of wrap-around services for those temporarily housed at the site will be an added benefit. “Taking people off the streets and putting them in housing changes the dynamic, and improves the chances that they will benefit from the services offered,” Espinosa said. Councilman Huizar, who has been at the forefront of many of the city’s initiatives to address the homeless problem, agrees that permanent supportive housing is critical. “Permanent supportive housing is a model that works,” because the individuals “don’t get lost.” In the meantime, we need “more immediate things” as the long-term solutions are developed, Huizar said. The El Pueblo site would consist of three trailers for beds, one trailer to house administrative workers and case management services, and one hygiene trailer with restrooms, showers and laundry facilities. Huizar said the hope is that the people who stay there could be transitioned into permanent housing within six months. Huizar also said the passage of Measure H, and the countywide Measure HHH that aims to raise $355 million per year for homeless services through a sales tax increase, was an indication that L.A. voters want their leaders to take aggressive action on homelessness. Some recent city efforts to combat homelessness have been met with opposition, including a proposal to put up storage units in Venice for homeless people to use that was met with a lawsuit in 2016 by a group of local homeowners. Huizar said similar opposition to the El Pueblo plan is likely. Homelessness in the city of Los Angeles jumped by 20 percent in 2017 while the county saw a spike of 23 percent, according to the results of the 2017 Greater Los Angeles Homeless Count. In the city, the total number of homeless went up to 34,189 and the county number increased to 57,794. January 17, 2018 Copyright © 2012 Eastern Group Publications, Inc.